Canned Air from Sydney is a middle-sized empty can, a gag souvenir with witty texts and images printed on it. The can is 88 mm (3,46 in) high and 86mm (3,38 in) in diameter. *turn upside down for better effect. *contains traces of the Sydney Tower Eye. *The Sydney Mint and George Street were not included to keep the air formula fresh. *might smell like eucalyptus tree. and helps fighting nostalgia. It is made by careful hands, all descriptions on the can are in English. Get yourself a piece of the city to remember. Feeling down? Got the blues? Buy a whole box of Air and open the cans whenever you feel sad, remember the atmosphere, marvelous time you spent in Sydney and feel better. Never been to Sydney? Order your can online and begin your journey while still at home! 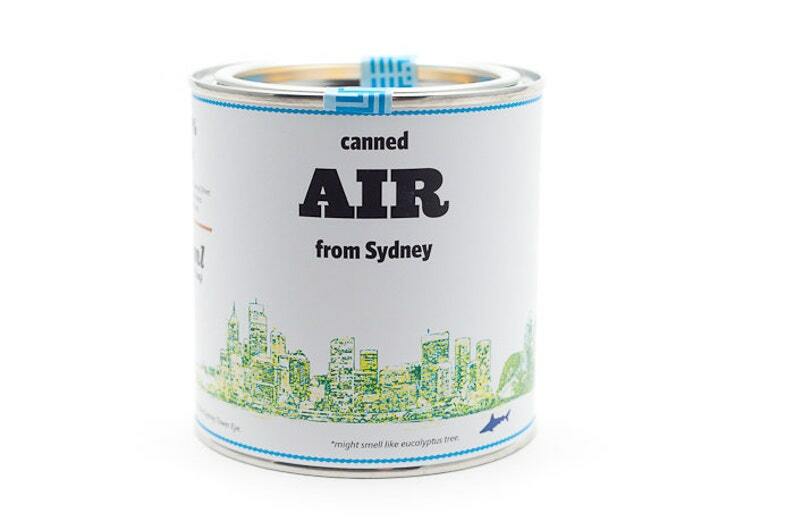 The Air of Sydney is also a great gift for your friends and family. Forget the magnets, cups and plates. Bring home something everybody will love and ask questions about. The Canned Air series is an art project, aimed at people who appreciate good package design, humor and love attention to details.